RIORI Vol. 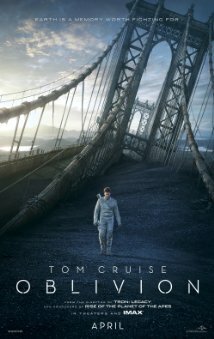 1, Installment 13: Richard Kosinski’s “Oblivion” (2013) | "Rent It Or Relent It"
Tom Cruise, Morgan Freeman, Olga Kurylenko and Andrea Riseborough. Earth. It used to be a nice place to live. Commander Jack Harper thinks so, especially now he’s stuck planetside salvaging scrapped tech and maintaining the automated defensive drones. An alien invasion took it’s toll on Earth, so everybody save Jack and his partner jumped ship and sailed off to Titan to begin new lives. Well, Jack’s stuck with his old one, indefinitely. Then one day a crippled starship enters his territory. Its sole occupant, a mysterious woman, leads Harper to discover some unknown, shocking truths about humankind’s legacy beyond broken cities and mechanized battlebots. Have you noticed lately that Tom Cruise’s roles lean towards the action hero type? The guy’s fifty-one. Can we say “mid-life crisis?” From the Mission: Impossible franchise to Jack Reacher to Oblivion, it may be now safe to say that his Top Gun days are well over. Best be sure to tell Tom this factoid. It’s time to retire into Forrest Gump territory. And that role gave Tom Hanks street cred. Ironic huh? Like the star of the Fast & Furious franchise going up in an auto-shaped ball of flame? And isn’t Morgan Freeman in every movie nowadays? I mean, other than schilling for Visa, hosting Through The Wormhole on the Science Channel, and (as an aside) portraying his best role, Easy Reader from The Electric Company, (that dates me) the guy’s been f*cking everywhere. Maine prisons. Rubbing elbows with rogue spies. Trundling bitchy Miss Daisy down to the Piggly Wiggly. Surviving cancer with Jack Nicholson. Off to Vegas with other geriatrics. Now he’s on post-apocalyptic Earth. Guy gets around faster than a rabbit with herpes. Tom Cruise stars as Jack 49, who is more or less as a garbage man in Oblivion. He is one of two humans that were left behind on Earth. Left behind? That’s right. Aliens called Scavengers (or “Scavs” for short) invaded our planet, destroyed the Moon (which in turn destroyed most of the ecosystem. You know, groundswells, upheavals, climate change, the usual stuff of sci-fi nightmares) and the surviving rest of humanity has jumped ship and headed off to Titan, one Saturn’s moons. Jack’s more or less all alone, save his eye in the sky Victoria (Riseborough), maintaining thousands of sentient robotic drones to monitor the planet and keeps eyes out for surviving alien hordes. As he puts it, picking up the waste, sifting through the dross for whatever valuable resources that could be recycled for the Titan mission. One day, on a routine patrol, a large starship crash-lands on the planet, bearing some human survivors, which the drones promptly dispatch with great efficiency. Jack, alarmed at the wanton killing comes to rescue, but is only able to save one survivor. A woman, who looks oddly familiar. So more or less begins our whirlwind adventure on a barren Earth with a futuristic trash man, the diaspora from an alien war, a human “stowaway” and a planet lousy with patrol drones and remaining Scavs who with to do us harm. The plot Oblivion is a thin one, but it tries to come across as much thicker than it is. The movie’s motif borrows from countless sci-fi psychodramas, from Blade Runner to Solaris to…to the Solaris remake with George Clooney. Oblivion has less to do with creating new worlds and more about proclaiming identity. It’s character drama. The concept of who you are in a given time under certain circumstances. Are you really sure of who you are and what those circumstances are? Are you lost? Is it the déjà vu all over again scenario? I don’t know, and film did not provide any easy answers. What it did provide was a visually clean farscape. Not ostentatious, with a lot of smart CGI. You know how most of today’s sci-fi films want to bludgeon you over the head with digitally rendered whatsits and foreign locales off-world with nary a modicum of subtlety? Right, Oblivion doesn’t do that. Instead it offers up a very real, one could say prescient view of a ravaged planet Earth. Did I mention the cinematography (including the CGI enhancement) is breathtaking. I won’t lie to you. Most of Oblivion is pretty damn beautiful. There was a bit more original drama than I had expected for a lifted plot. Actually, this movie is more a melodrama wrapped up in the guise of a sci-fi flick. There’s a good amount of play and tension against the characters, not unlike a relatively well-wrtten soap opera arc. And like your daytime dramas, there is plenty of intrigue and weird plot loops tossed about. It’s tricky to give a clear explanation about what Oblivion is really about because, 1) it’s near impossible without dumping spoilers all over you, and; 2) it’s not exactly clear what Oblivion is trying to say. Don’t get me wrong. The film is interesting. It’s also obtuse as hell, and can make for a confusing viewing experience. But it’s sci-fi, only when it’s not, and when it’s not…um, it’s something else. Stop yelling at me. This was a confusing review to write, and it shows. Mostly because I didn’t know where to stand on this film. It wasn’t bad. It wasn’t good. It was rather confusing as if the film couldn’t make up its mind. It sure as sh*t met The Standard considering its lousy turnout at the box office. Is that a reflection on this movie? Kinda. I don’t know. All I can say for sure is that Oblivion was pretty. Rant it or relent it? I don’t know about this one. You need to come up with your own opinions about it, so I guess rent it and cook up some. The crashed ship looks a lot like an overweight relic from the Mercury Program. A nod to the then, last defunct endeavor humanity launched into space? The sunglasses thing. Meta for Top Gun? “Are you okay?” “No.”…”Are we gonna die?” “No. Maybe.” Life in a nutshell. Ever been the observation deck at the Empire State? With those quarter binocs, you can really see forever. Nice touch with view of WTC One. The tragedy was not lost on Kosinski. To him, an apple. My grandma had a crush on Tom Cruise. Always found that endearing, especially with an octogenarian. Idris Elba and crew defend the Pacific Rim from monsters with—what else?—giant robots. Desperate times and all that. This entry was posted in Action/Sci-Fi, Movies and tagged Morgan Freeman, Oblivion, Richard Kosinksi, Tom Cruise. Bookmark the permalink.